A Federal California judge has ruled in the patent infringement case between Broadcom and Qualcomm. Broadcom claims that Qualcomm is infringing on three patents, covering WCDMA chips, EV-DO chips, and technology around mobile video compression, walkie-talkie services, and simultaneous network connections. The judge decided that Qualcomm has to immediately stop shipping all 3G/WCDMA chips infringing on the patents. However, for the EV-DO chips, they’re allowed to continue selling, but with restrictions. 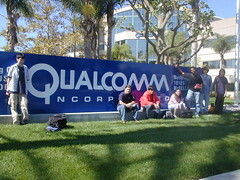 The EV-DO chips that Qualcomm has been selling since May 29th, 2007 can continue to be sold, but only to existing customers, and only until January 31st, 2009. On the 31st, they must cease selling/shipping the chips, and are barred from infringing on the patents again. Also, Qualcomm must pay mandatory royalties to Broadcom for all chips sold and shipped between now and January 31st, 2009. Broadcom was seeking a much more strict ruling, and has already complained that the chips that Qualcomm says work around the patent are still infringing. Qualcomm used to manufacture handsets, in addition to chipsets and the like. In fact, my first cellphone was a Qualcomm on Sprint’s network here in the U.S. However, as of late, they’ve become what appears to be little more than a patent holding company, which really bothers me quite a bit. They’re at odds with the ITC, as well as with Nokia and most of the other cellphone manufacturers for unfair licensing policies. At the same time, I do believe that they should be compensated for the things they’ve researched and designed.